The offered ornament pieces are old/antique and used single items; no tourist- or order products. Because each ornament is an hand made original, small deviations to the illustration are possible at delivery. Silver content of items are between 35-90% Ag. Typical talisman box, "tcherot", as used by women and men of the Kel Air Tuareg Tribes and the Fulani. Front- and back side are manufactured from good silver sheet. Suspension with black single strings of thin leather strings. The Front is decorated with copper plates. The pendant is decorated with the typical Tuareg engraving work and signed on the back in "tifinagh". You cannot open the suspension. 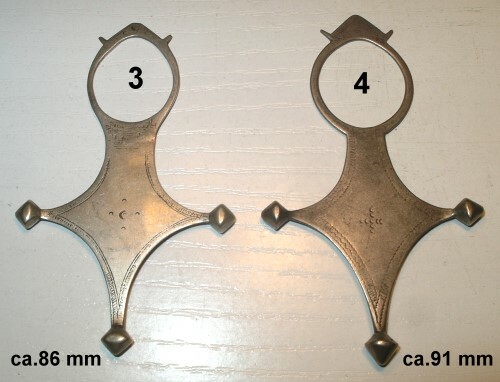 A pair of silver upper arm bracelets. Bracelets made of silver metal, partial covered with rune similar signs. Some show inscriptions of the manufacturer/owner? Today these bracelets are not produced any more! Outer diameter from 70 to 85 mm. 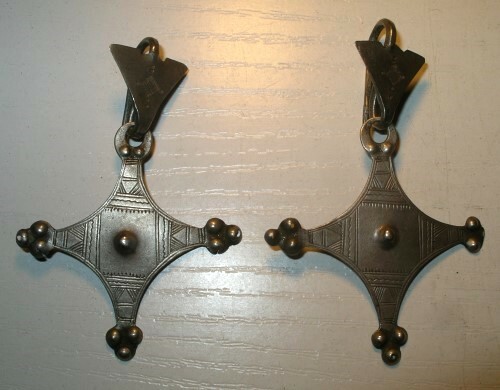 2 old tuareg amulets type "corcoro". 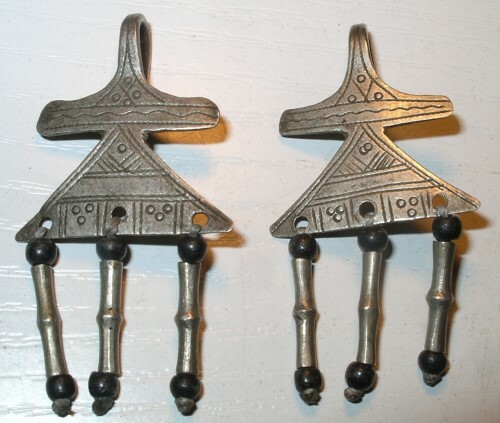 These amulets are worn by men of Tuareg Tribes in the Air mountain region. These amulets are consisting of good silver and are decorated with the typical Tuareg engraving work. Old "Hombori" bracelet made of stone, mainly worn at the upper arm by the Tuareg people. They are already produced since generations in the area around Hombori for the Tuareg and sold to them. The material is a soapstone from the Air mountains. Weight: 160-180 g and more. 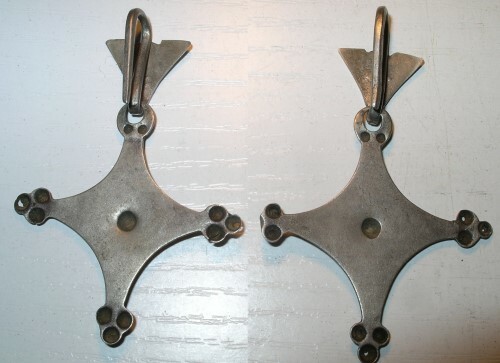 Old tuareg ear pendants made of silver. The front is decorated with the typical Tuareg engraving work. The long silver beads (ca. 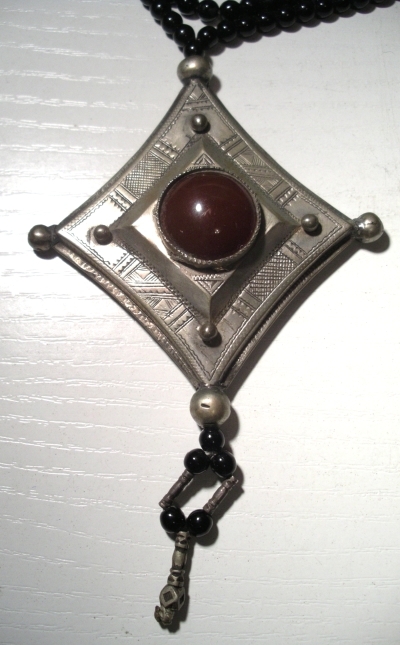 11 mm) type "ismana" and the black glass beads are hanging moveable. Mauritanian anklet "khalakahl", made of solid silver. Prosperity indicator with money- and exchange function, traditional means of payment. 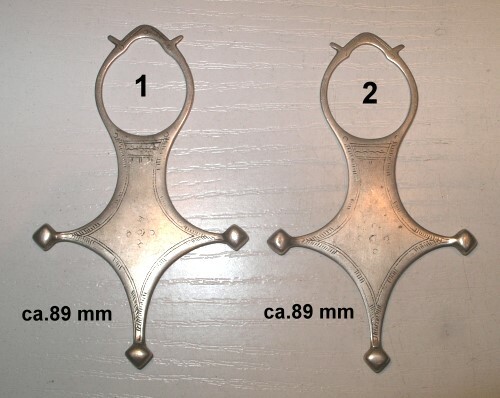 Mauritanian anklet "khalakahl", made of aluminium. Opening between balls: ca. 40 mm, you can change distance a little by bending. The "chomeissa", a typical woman ornament of the Tuareg and Bella tribes. 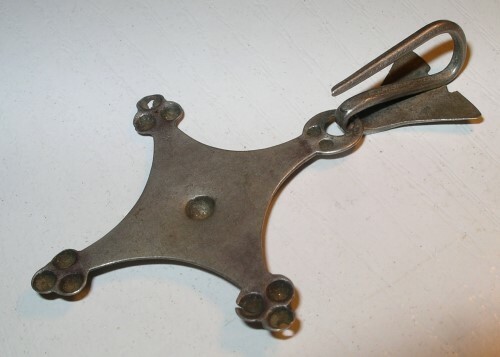 The pendant consist of 5 shell- or bone plates sticked on the leather pendant. This ornament for a Targia is so important, that an idiom says, she would prefer to go naked, than without a "chomeissa". Old Tuareg solid silver bracelet with heart motive, inside heavy silver chloride patination. Outer diameter: 60 mm, inside ca. 54 mm. 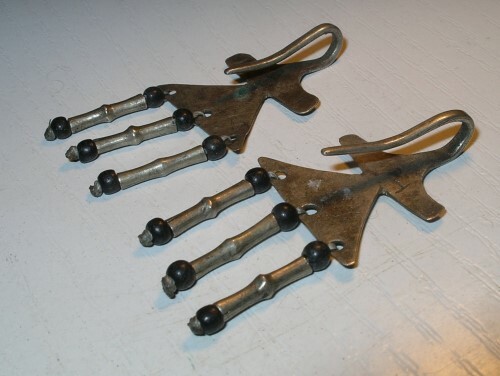 4 old Agadez crosses made of good silver, pulled up on a black wool string. In this way they were frequently used around the neck by the women of the eastern Awelimmiden tribes as ornament and traditional payment. The wool string is torn in half. 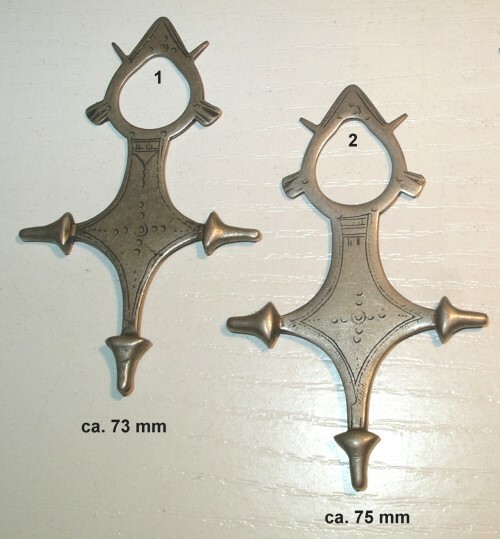 Old Agadez crosses made of silver. The carnelian pendant "tanfouk" will be used of almost all tuareg tribes. The first pendants came from India and later, up to the 20th century A.D., were also produced in Idar Oberstein, Germany. 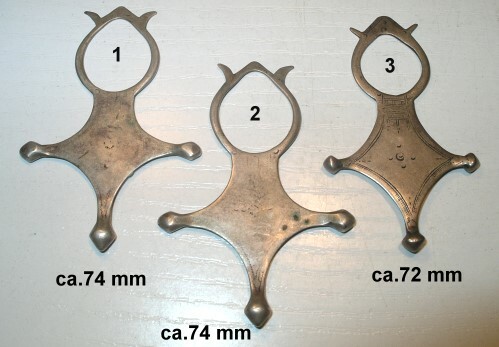 The pendants were manufactured in different sizes. They were carried mainly as chest- and hair ornament. Old Tuareg back pendant "schirot" with original suspension from leather. Front side manufactured from silver sheet, rear side of sheet iron. Rattle sheets made of tin andBack 3 french coins dating 1924, 1937 und 1938.  Dimensions (HxBxT): ca. 123x165x6 mm. 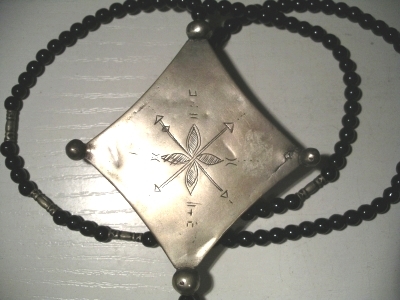 Old Tuareg cross made of silver, type "In Waggeur". New on stock, picture only similar! Dimensions (HxB): approx. 77-80x31-37 mm. 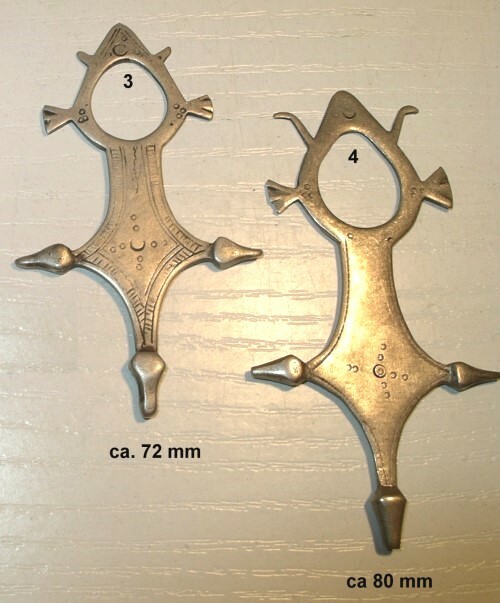 Old Tuareg crosses made of silver, type "Agadez". 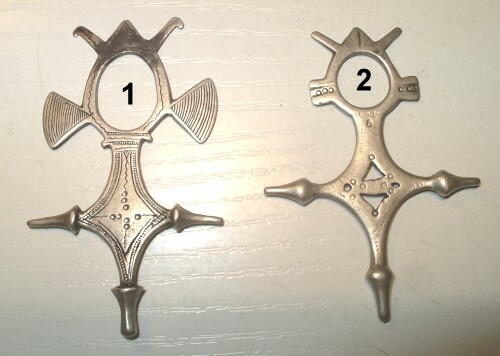 Old Tuareg cross made of silver, type "Tahoua". Ethiopia, Rashaida armlets of silver metal. Typical talisman box, "tcherot", as used by women and men of the Kel Air and Fulani tribes. The pendant has centrically a dark brown inlay from glass or dyed stone. The backside ist signed with "tifinagh" inscription. The necklace is made of beads (ca. 4 mm) from black glass- and long silver beads (ca. 11 mm) type "ismana". 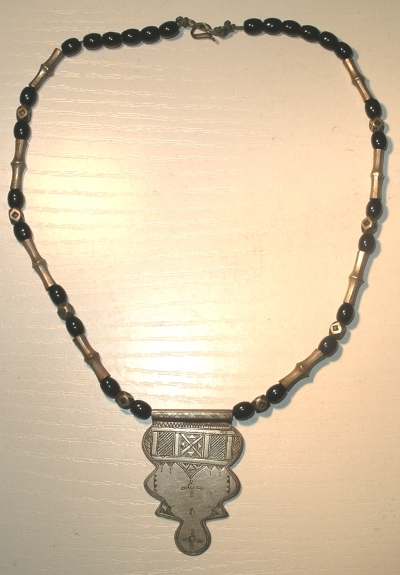 Old tuareg necklace with a silver pendant. The pendant consists of good silver and is decorated with the typical Tuareg engraving work and signed on the back in "tifinagh". The necklace consists of ovoid black glass beads (ca.4,5/5,5 mm), long silver beads "ismana" (ca.16 mm) and octaeder beads (ca.4 mm) of silver. You can open the necklace. Old tuareg necklace with a pendant of silver alloy. The pendant is decorated with the typical Tuareg engraving work. 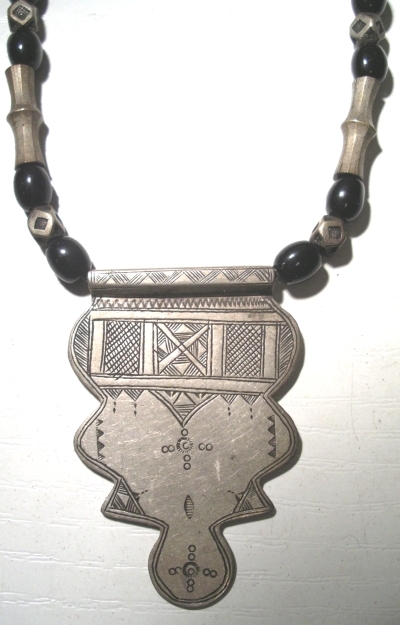 The necklace is made of black glass beads (6 and 3 mm) and long silver beads (ca.15 mm) type "ismana".